Sometimes a film can get by with an interesting concept but not much else. 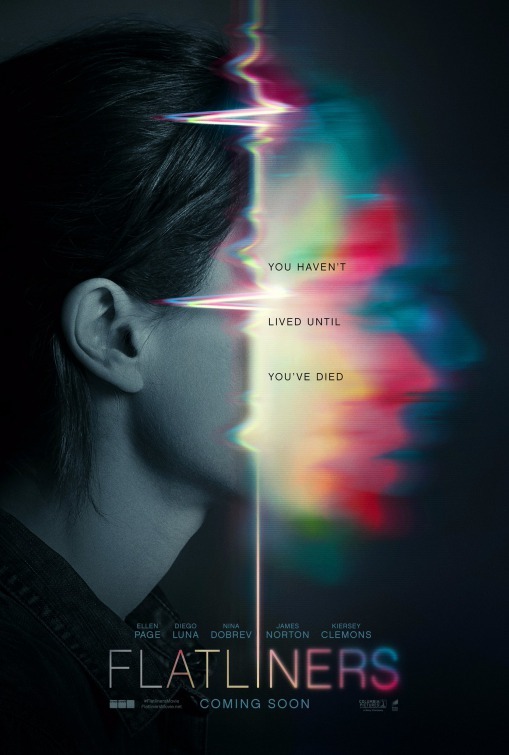 The new remake of the 1990 film Flatliners arrived in theaters this weekend already D.O.A. and no amount of resuscitation would help this film’s heart to keep beating. I am sure that I am not the only movie reviewer to start off their review of Flatliners with some bad puns, because that is about what this remake is worth. Originally, there had been some rumors that, because we saw that Kiefer Sutherland, who appeared in the original film, was in this as well, it was actually a sequel to the first film. You can put that rumor to rest. Flatlines is not a sequel but a lukewarm and, at many times, dull remake of the Kiefer Sutherland-Julia Roberts film. The idea is sound. A group of medical students get together to try and discover the secrets of the afterlife by having the others stop their hearts so their brain responses to the “near-death experience” could be recorded and studied. Courtney (Ellen Page) started the experiments and recruited other interns Sophia (Kiersey Clemons) and Jamie (James Norton) to help. When it appeared as if Courtney was not going to be revived from her trip into death, they called on the help of Ray (Diego Luna) and Marlo (Nina Dobreva). When Courtney returned to the world of the living, she seemed to have re-wired her brain and she could do many new and sparkly things and the others wanted their turn. Little did they know that there was something dark and sinister waiting for them when they returned. So much of this new version of Flatliners makes no sense and there are characters who do certain actions that are, simply put, stupid choices that only are made to further the plot. No normal human being would make some of the decisions that these obviously stupid reason-for-malpractice-insurance group of doctors would make. Let’s look at Ray, whom I actually did like. At first when he found out about the experiment, he was all “you can’ do that” and then he joined them again. After that he was partying with them, doing shots, but he was still not sure if this was anything but silliness. Still, he was right there with the group each time. He was flip-flopping all over the place taking away any credibility the character may have had. The film starts with a really dumb car crash that is supposed to provide Courtney with a motive to pursue this experiment, but it does not sufficiently provide said motivation. In fact, it is only meant to be more confusing. The dialogue was terrible, bordering on laughable. No human beings speak like that. It joins in with the weakness in story, plot and conclusion. The ending is totally a joke. We never really understand what the dark force that was trying to kill these flatliners was… except it went away fairly easily. There was an interesting possible story here, but the film seemed to do anything it could to avoid telling it. The characters were all unlikable, except perhaps for Courtney because she was being played by the strong actress Ellen Page. The rest of the crew were average to below average. Worse yet, the film makers tried to throw a bunch of jump scares into the movie to ratchet up the intensity level, but none of them were anything but your typical, low-budget horror movie jump scares that you see a hundred times during a year. There was nothing special about these scares. I do not remember much about the original Flatliners movie. I do believe I saw it, but it did not stick with me much. Perhaps I should revisit it to see how much better it is than this film. It has to be better than this film. The new version of Flatliners was a bad movie.